Measure not counting ovipositor nor antennae. Compare the male that I found the next day. Heterospilus sp., prob. eurostae Viereck -- Paul Marsh det. his comment to all your Heterospilus pix moved simultaneously: "One species, H. eurostae Viereck, has been recorded from Eurosta solidaginis on goldenrod. 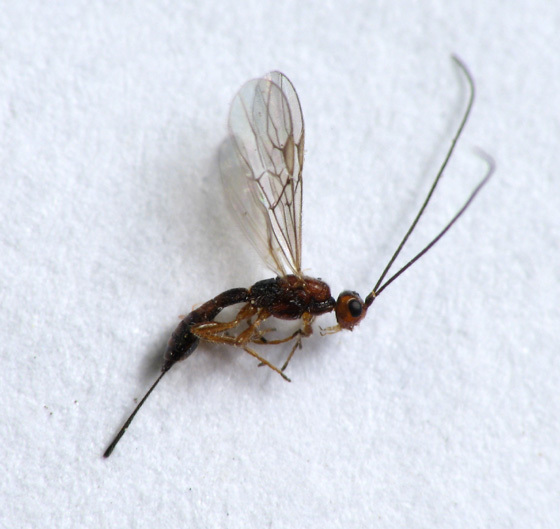 But this may not be correct since Heterospilus is not likely a parasite of Diptera. I suspect it may have attacked a lepidopteran larva or beetle larva in the gall. However, we are finding lots of phytophagous Doryctinae and it may be that this one actually causes the gall. At least you can definitely say it is a Heterospilus and probably eurostae." With host info there is a good chance that this could be narrowed down to a genus or species. The gall maker is the fly Eurosta solidaginis. The parasites are two wasps, Eurytoma gigantea and Eurytoma obtusiventris, and the beetle, Mordellistena convicta . Would any of these be the host of this one? My knowledge stops here. The references are on the info page for Eurosta solidaginis.